Northern New Brunswick has some of the best Ruffed Grouse hunting in North America, the spots we hunt in are primarily second growth hardwood areas which provide favorable conditions (food and cover) for large numbers of Ruffed Grouse. 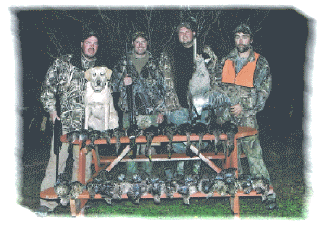 Ruffed Grouse hunting can be done driving or walking; with or without the assistance of dogs. 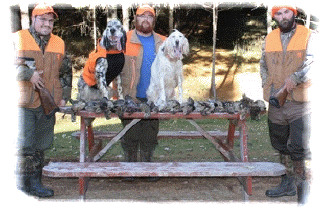 For those of you who would like to hunt with a dog but don't have one or find traveling with one inconvenient we have two seasoned English Setters available to assist in your upland game bird hunting. New Brunswick has a very generous limit of 6 grouse per day (12 in possession). The season dates for Ruffed Grouse hunting in New Brunswick are October 1 through until early December. Spruce Grouse may also be found occasionally in some of our hunting areas and although they are not the excellent table fare their Ruffed cousins are, they are a popular bird to have mounted; the males have bold black and white coloring with a striking red patch over the eye. For anyone interested in deer hunting and combining this into their hunt it should be noted that grouse hunting does not require the purchase of any additional licenses. You can visit our general information page for more details on combining hunts and hunting regulations. We also have a large Woodcock population in the region, 2015 was an exceptional year, during our hunts last year we had the dogs go on point as many as 175 times per 5 day hunt. The season for Timberdoodles begins in mid-September; during this time we hunt the "native" population then as October rolls around we get a large number of migratory birds and hunting is good until month's end. Our season starts 2 to 3 weeks ahead of the Woodcock seasons in the New England states and offers a great opportunity for those hunters (and dogs!) anxious to get an early start pursuing this popular game bird. For Woodcock we target lowlands around the river basin as well as second growth areas. Woodcock hunting requires the purchase of a Federal migratory game bird hunting permit(about $20) in addition to a provincial hunting license that covers small game. Canada Geese are now prevalent in our area; a large local breeding population has gained a foothold, this combined with an increase in migratory geese affords an excellent opportunity in our region. A mixture of puddle and diving ducks species also call our area home and chances may arise to take them while goose hunting. 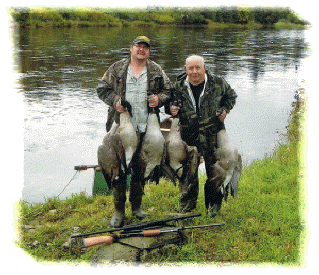 Hunting for geese (or ducks) requires the use of steel shot and as is the case with Woodcock, a migratory game bird permit is required in addition to a provincial hunting license.